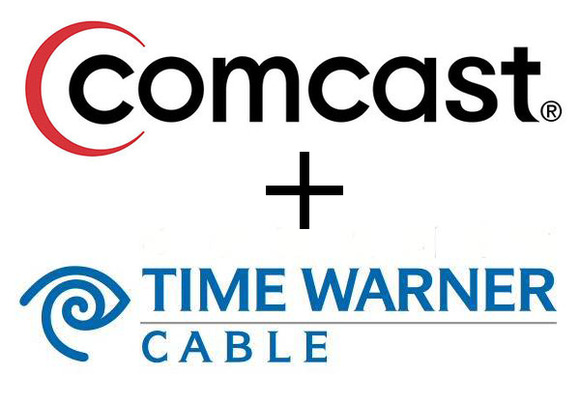 Antitrust enforcement agencies should reject a proposed $45.2 billion acquisition of Time Warner Cable by Comcast, because it would give the combined company huge market power in the broadband and cable TV industries, a handful of consumer and digital rights groups said. Comcast is the largest provider of broadband and cable TV in the U.S., while Time Warner Cable is the second-largest cable provider and third in broadband, although Time Warner Cable has fewer subscribers than satellite-based providers DirecTV and Dish. The deal, announced Thursday, would give Comcast approximately 30 million broadband and 30 million cable TV customers, after the company’s promise to sell off systems covering 3 million subscribers. If the deal passes scrutiny, the next largest wired broadband provider would be AT&T, with about 16.5 million customers. Verizon would be a distant third, with 9 million subscribers. AT&T and Verizon both offer mobile broadband in addition to their wired broadband services. But consumer and digital rights groups Free Press, Public Knowledge and Consumer Watchdog all called on the U.S. Federal Communications Commission and the Department of Justice or Federal Trade Commission to reject the deal. The Communications Workers of America, a union representing about 5,000 workers between the two companies, also said the proposed deal raises concerns about jobs, competition and consumer costs. “The two companies have a high bar to meet to demonstrate that the merger would be in the public interest,” the group said. The combined company would control about a third of the U.S. cable market, with the deal focused on leveraging video, voice and broadband in the so-called triple-play market, said Harold Feld, senior vice president at Public Knowledge. The deal would give the combined company about half of the U.S. where triple-play services are now available. The deal could take away several avenues of competition or potential competition, added Derek Turner, research director at Free Press. The acquisition would raise concerns in the set-top box and home router markets and it could remove Time Warner as a potential future competitor to Comcast in the not-yet-developed virtual cable market, in which a competitor delivers multichannel cable service over broadband, he said. Antitrust agencies could also look at data cap fees that Comcast is rolling out to some broadband customers, Turner said. “Their market share would control such a large share of the broadband market that they would have the ability, not only to dictate it for their own customers, but dictate prices for the entire industry,” he said. Cohen, during a press briefing, downplayed the concerns. “Once you take a breath, and think this through analytically, and get past some of the hysteria, this transaction is pro-consumer, pro-competitive [and] strongly in the public interest,” he said. Comcast does expect a “thorough, a rigorous, and an appropriately critical government review,” he said, but it expects the deal will gain approval. With antitrust law focused largely on the effect of mergers on competition, regulators will see that the deal has no impact in that area, he said. The deal would extend net neutrality rules that Comcast agreed to in its 2011 acquisition of NBC Universal to Time Warner customers, and it would allow the company to bring a low-cost broadband service to more cities, Cohen said. The deal would also mean higher broadband speeds for Time Warner customers, he said. Consumers will see a better quality of service, and the combined company will give them technological innovations, he said.